High-silica zeolites, some of the most important and widely used catalysts in industry, have potential for application across a wide range of traditional and emerging technologies. However, there is a huge problem with synthesising new high-silica zeolites, as under hydrothermal conditions, all zeolites form as the lowest energy-density structure. Using the Assembly-Disassembly-Organisation-Reassembly (ADOR) process, allows one to synthesise zeolites that are thought to be “unfeasible” using traditional methods. A diagram highlighting the four main steps of the ADOR process. The initial double-four-ring (d4r) – containing parent zeolite UTL is broken down through hydrolysis to make a layered intermediate IPC-1P. These layers are organised before the Si-O-Si bonds are reformed through calcination to form a reassembled material with a different structure from that of the original assembled parent. We decided to embark on creating a standard protocol for the ADOR, in the hope that it will allow the technique to become more accessible to other researchers. We hope that by developing a clear protocol it will lead to more people using the ADOR method to synthesise new zeolites. To be successful in ADOR, zeolites must contain double-four-ring units with germanium preferentially located within them. It is the presence of germanium in these d4r that allows us to disassemble the parent zeolite into layers that can then be rearranged into a new position and therefore produce a different zeolite from the parent. A plot of the variation of d spacing of the 200 PXRD reﬂection versus time for the ADOR reaction carried out in water at 100 °C. The plot clearly shows the different regimes of the process. 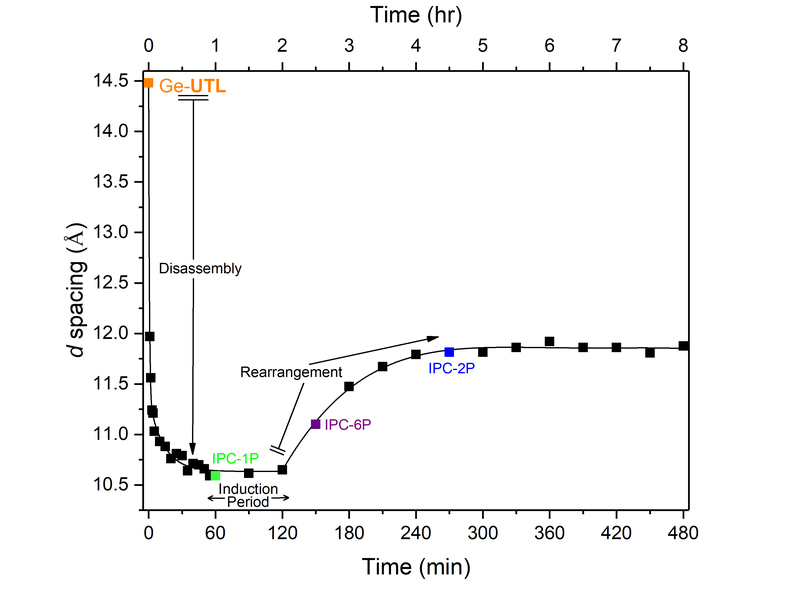 The disassembly of the parent Ge-UTL zeolite happens rapidly and is complete within 1 h. There follows an induction period during which IPC-1P is the only identiﬁable product. Following this, a new process (organisation) occurs in which the d spacing increases, ﬁnally forming a different product, IPC-2P. To develop this protocol, we investigated a wide range of conditions, including temperature and pH using an archetypal parent zeolite, UTL. To monitor the progress of reaction, we took samples of the hydrolysed material every 1 – 30 min over a time period of 8 – 30 hr. The samples were analysed by PXRD and showed us the stage of the reaction and which product was being produced at that time. Although Ge-UTL is used here, the protocol is designed so that any parent zeolite can be substituted in its place. A question often asked is about the universality of the ADOR process. In our experience, all germanosilicate zeolites that have the requisite compositional and structural features can be disassembled, organised and reassembled into new zeolites. In that sense, the ADOR process is perfectly universal, given the described limitations on chemistry and topology. However, the key is to identify the right conditions—and we believe this is where this protocol will ﬁnd its most enduring impact.